Nearly two-fifths (37%) of all Hispanics are foreign born, compared with 13% of the overall U.S. population. The groups with the largest foreign-born shares are Guatemalans, Hondurans and Peruvians (all 67%). 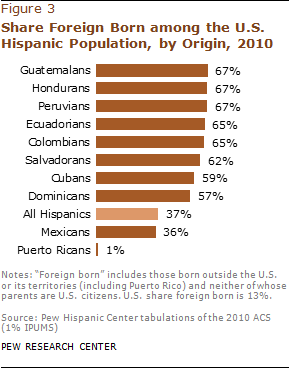 Mexicans and Puerto Ricans are the only Hispanic origin groups with majority native-born shares. Only 36% of Mexicans and 1% of Puerto Ricans6 are foreign born. Hispanics on the whole are younger than the general U.S. population. The median age for Hispanics is 27 years while for the U.S. population it is 37 years. The youngest Hispanic groups are Mexicans (25), Puerto Ricans (27) and Guatemalans (27). 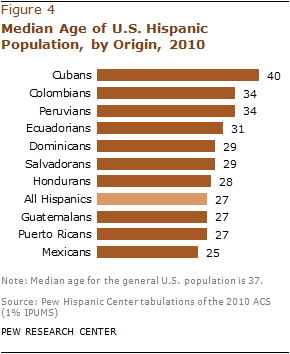 Cubans are the oldest Hispanic group, with a median age of 40 years. Their median age is also higher than that of the U.S. population (37 years).